Just when you thought you’d seen the last of pie charts and percentages for the summer, I give you this. The results of last week’s Gracelet poll. I wasn’t kidding when I said only 200 could vote because I didn’t pay for the upgrade but somehow an extra 128 of you made it in anyway. Love that. Clearly silver/turquoise was a favorite so we will make that one for sure. I sent your results to the designer so she can give you what you want and I’ll keep you posted with updates. I’m so glad you’re as excited as I am for these. They’re going to be ah-mazing. 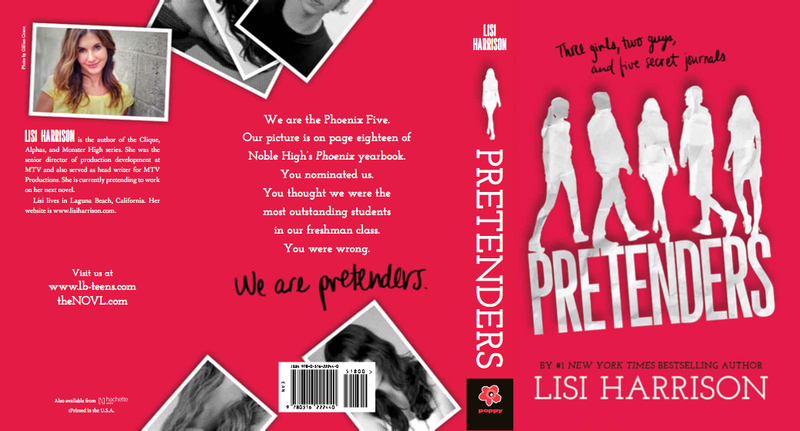 The final cover for Pretenders. You chose that picture of me, remember? I ah-dore how well we all work together. P.S. That picture of BeeBee was taken yesterday after she had 22 teeth pulled. I love you Beebs! I’m going to read this! Poor BeeBee… My love is with her!! Lisi! I love your books and everything about you! I thought you would be interested to know you have a whole database of religious followers right here on WordPress :)! Most of us are following you! You’re books have brought together an amazing collection of girls who wouldn’t have known each other otherwise. Can you please check out some of our ah-mazing blogs and tell us how you like them? The cover looks so good, and professional too! If I didn’t know you already, and I saw that book cover in the store, I would definitely be inclined to pick it up. P.S. Sorry I have been so MIA in the comments lately! Okay so can anyone fill me in on the gracelets? Clearly I missed that post. But I agree with the posts from before! Lisi, I think you should write a massie spin off novel. Something about her after she gets 2 England! You should REALLY do it! Also since you had a contest about writing about the Pretty Committee ten years in the future, I think you should have a contest about writing about the AFLs or Alphas For Life (obviously u no it’s Skye, Allie, and Charlie). But it’d be a fun summer contest! Thank you sooooooooooo much for the birthday shout-out, it means the absolute word to me! !